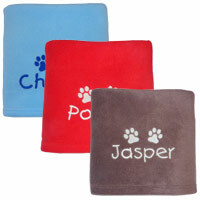 This item is personalised and usually dispatched within 5 working days. Delivery is by Interlink courier. Let your dog stake their claim with one of these gloriously comfortable and attractive personalised dog beds. 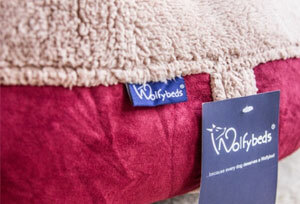 The Wolfybed donut is a cosy round bed that your dog will love and it will look great in your home too. 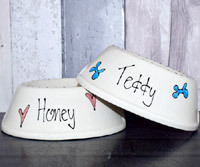 Beautifully embroidered with your dog's name. Warm, supportive and so comfortable. 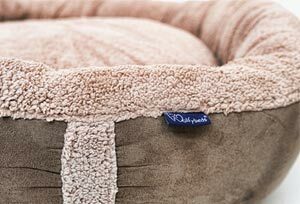 Low bolster sides and cosy fleece mean this bed is sure to become your dog's favourite place to snooze and sleep. 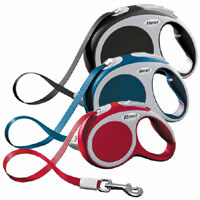 Curl up or stretch out - whatever your dog loves to do, these fit the bill. 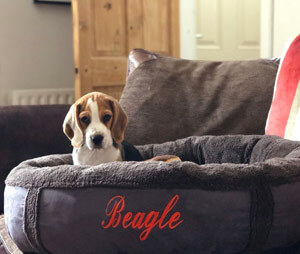 For that extra special touch or the perfect gift idea, each bed is beautifully personalised with the lucky dog's name embroidered on the front of the bed. 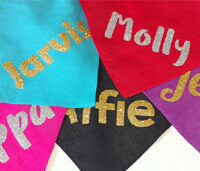 You have a choice of coloured thread for the personalisation, which can be one word (max. 8 characters) which is included in the price or add an additional word for an extra charge - perfect if two dogs like to share. The font will be chosen for you to suit your text perfectly. 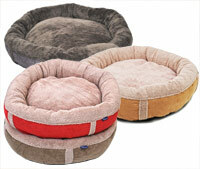 Featuring two spun-polyester filled cushions for the ultimate comfort. The inside cover is a warm fleece. The outer faux suede co-ordinates beautifully. 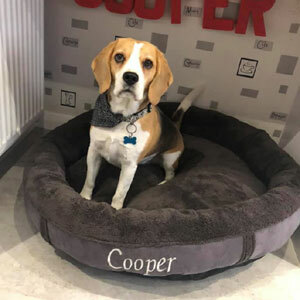 The bolster sides help support your dog's head and neck or provide the perfect snug retreat for curling up, safe and sound. 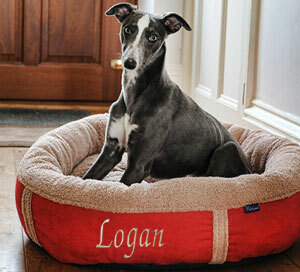 Luxury and comfort for your best friend with a beautiful look to complement your home, all at an affordable price. Woof! The covers are zipped and fully removable. 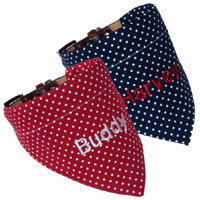 Available in Medium or Large sizes for Westies to Collies. * Due to the soft materials used, all dimensions given are approximate. ** Intended for guidance only. 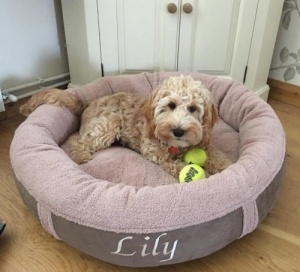 We strongly recommend you measure around your dog while they are in their favourite sleeping position and use that you determine which size to purchase. The covers are zipped and fully removable. Machine washable at 30 degrees on a gentle wash. Wash separately. Do not tumble dry or dry in front of direct heat. We advise against washing the internal cushions/filling. Take care with placement. There is a slight possibility, especially with the more vibrant colours, of dye transference onto lighter materials and/or furnishings in the home, particularly when the bed is brand new. We accept no liability for such an occurrence. 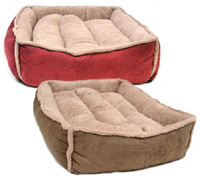 Soiled beds or those damaged by the dog cannot be returned. These beds are durable but not indestructible. 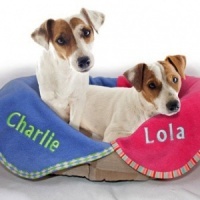 I bought a lovely bed with name on and collar/lead from this company. Customer service is very good and delivery fast. Items are well packed. 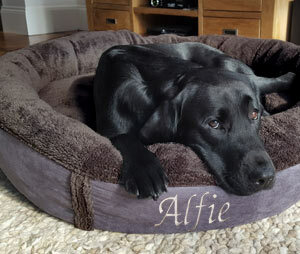 This bed is great, very well made and lovely and comfy for my dog. My dog likes it so much she has stopped sleeping on my bed and instead sleeps on her own bed for the first time in 6 years. 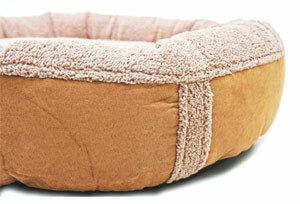 I absolutely love the large donut bed I bought for my Jack Russell Terrier. Because my dog is small, the large donut bed is like a kingsize bed for him. 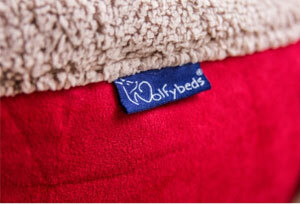 The bed is of great quality and delivery was quick. I would definitely recommend. Amazing quality and super fast delivery! My cocker spaniel & staffy x whippet love their beds (and so do I - very comfortable)! Highly recommended. Tamu just loves his new bed. It is so comfortable, and the colours fit perfectly with my colour scheme in the lounge. Also great value, and would highly recommend. We experienced the most amazing service from D for Dog. 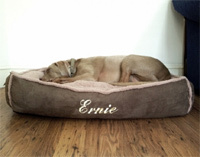 The order arrived the next day well packaged and our Maggie absolutely loves her new personalised bed! 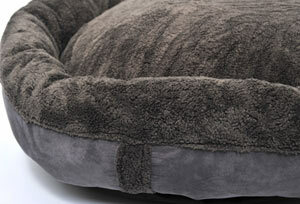 High quality and extra comfy dog bed! Very impressed with this company and its products. 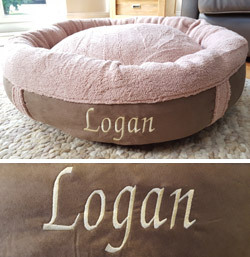 Phoned me to discuss my order and confirm my choices for font when embroidering our dogs new bed. Fast delivery and well packaged. Can't recommend them enough. Ordered a second one. Over the moon with this product.